Neither player can target “Zombie World” in the Field Zone with card effects, also it cannot be destroyed by card effects. 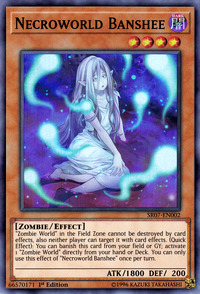 (Quick Effect): You can banish this face-up card from your field or GY; activate 1 “Zombie World” from your hand or Deck. You can only use this effect of "Necroworld Banshee" once per turn. The lake of blood from the artwork of “Zombie World” appears on this monster’s artwork. In Irish mythology, a banshee is a female spirit whose wails and cries often herald a person's imminent death. This card is the only member of the Field Searcher series that cannot add its corresponding Field Spell to the hand by discarding itself. This card in particular does so by banishing itself from the GY.